What if there were a way to keep the chi in your meridians flowing better? I want to tell you about an energy healing device I keep with me 24/7. I was in Australia last year and went to see a spiritual teacher with a friend. We had to cross town, so we left early and we arrived early. So I was browsing the wide variety of goods for sale in the back of the converted church hall. There were the usual books, but I was amazed to see various energy healing trinkets. One caught my attention and I asked about it. It was a titanium disk a little bigger than a silver dollar. The woman behind the table told me to hold out my hand. When the disc was placed in my palm a wave of peaceful/harmonious/calm energy passed through my entire body in about two seconds. I wanted a disc, but they were $400. A few days later I searched for the manufacturer online and in the results was the name of another, competing company. I waited until I returned to The States to call them. It turned out that the disc–actually a “pendant”–was so expensive because it was being distributed by multi-level marketing. This other company I found on the internet had the exact same technology at about 45% the cost. So I ordered one. A week after I began using the pendant, the company president called me to tell me that the spiritual teacher, “Isira”, in Australia had contacted him to ask to try his pendant and wand. Another week later he contacted me to tell me tha Isira had switched from the multi-level marketing company (Amega) to his. This gave me complete trust in the pendant I had, because Isira clearly has a heightened awareness of “energy” and phenomena beyond this dimension. Before I began using the pendant, I had not been working, but still I would feel stiff every morning. I would joke that I felt 90 years old for the first 5 minutes out of bed, 80 years old for the next 10 minutes, and 70 years old for the following 10, until I finally felt like I was 40 years old (even though I was 54 at the time–I am young for my age). Well, I got the pendant at the same time that I arrived at my Alaska cabin. Being at my Alaska cabin always means a lot of hard work, and this year was the hardest work in a long time. I had to jack one of my cabins up, pull the 17 log pilings out (they were 50 inches deep) and replace them with concrete. I worked almost every day, often 10 hour days, for 6 months (I also added a room), and never had one single morning of stiffness. I wore the pendant in my watch pocket every day, and slept with it every night. For the past few years I had been having gall bladder/liver pain from a rib injury that I got in martial arts. That pain disappeared after wearing the pendant. I also had been experiencing skips in my heart beat for several years. My heart would stop and miss a beat, then come back very strong for a few beats. This was a daily experience. After a few months wearing the pendant, I realized that I hadn’t experienced that in a while. Now I can’t even remember experiencing it in recent months. After Alaska, I returned to California and began working out at a gym. I have done this many times and I know how long it takes to get back in shape even though my body was used to work. Typically it takes me 3 weeks of workouts before I can begin training hard enough to get into good shape, and then, after another 3 weeks, I can work out hard. After only 3 weeks I felt strong enough to work out hard. I think it was because my recovery time was reduced. I was doing a lot of yoga too, and doing better than ever at it–able to relax into the stretches more so that I could extend my attention throughout my entire body. My gym shorts have a key pocket that I never noticed before–just right for the pendant to slide into. So, I will tell you that the pendant gave me greater musculoskeletal ease, increased flexibility and strength, and increased organ function, just as the company suggests. I am now an affiliate with the company in Canada that distributes these pendants. I am thinking that if I am to be recommending these to people, I should get a commission from doing so, and they offer that option. So if you use this link to visit the site, the company will give me credit, should you make a purchase. And if you recommend the pendant to a friend, please pass on this link. It routs the path through a company that records the referral to me. Auric gives a 45 day money-back guarantee, so I recommend that you try it. I also recommend that you bring yourself to full presence and awareness of your energetic body before you hold the pendant for the first time. My experience is that the shift happens very quickly, and is easy to miss. If you have the ability, I’d even recommend that you have another person unpack the pendant and heat it to body temperature for you while you meditate and tune in to your energetic state, then hold out your hand and have them place it in your hand. The warmed pendant will prevent the cold metal from distracting you. It seems that after the initial contact, normal people have a hard time feeling the “subtle energy,” so your first moment with the pendant is your opportunity. I met an energetic healer in Alaska this past summer and I asked her to hold my pendant. She said it was very powerful, and said she could feel my energy in it. Donald at Auric tells me that these pendants will radiate the energy for about 25 years or more, so it seems that it costs about a penny a day. There are 2 kinds of pendant. The one I use is called “Pranic Balance” and is used for physical well-being. The other is called “Bliss,” and is more for emotional well-being. 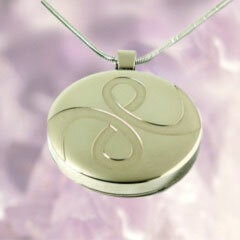 If you have mood swings or problems with depression, the Bliss pendant is worth a try. There is a lot of information on the website for you to read about this technology, it’s origin with a Russian physicist, and people’s experiences with it. The main product is the “Infinity wand.” The wand is effective with some types of pain and problems and not so effective with others, and I am not sure how to explain that. It seems that new injuries are easier to heal than old ones, and I have very few new injuries and lots of old ones. It also seems that pain that is simple and local (eg: you banged your toe) is easier to heal than complicated ones (elbow tendonitis resulting from diminished chi supply due to muscular holding patterns from several old shoulder injuries combined with a problem with the tooth that corresponds to the meridian serving that elbow). The bottom line is that to use the wand, you have to USE it. You have to spend time with it working the area and maintain you intention to heal at the same time. I find that most people don’t want to take time to experiment with such things. The pendants are not designed for healing, but for increased well-being. They are for individual use only. They meld with your personal energy, so you should not allow others to try it. It is yours. The wand can be used by anyone, though “cleaning” them is recommended if they are to be shared. These tools are cleaned of stagnant and negative energies by a few minutes of running water, a few hours of sunlight or exposure to an amethyst crystal bed (organized energy). Auric has packages for couples to each have their own pendant and share a wand. Good Deal! Some people have trouble sleeping with the pendant at first, but gradually get used to it. Auric also sells a EMF protection pad for your cell phone. I use one. People ask if it works. I answer that I am not sensitive enough to know. But I have read enough to know that no one should hold a cell phone to their head with any regularity, and any diminishing of cell phone radiation has to be a good thing.